Historically, industrialisation has been synonymous with development. Most high-income countries (HICs) achieved that level of prosperity through manufacturing export-led strategies. Few countries in the past have reached high-income levels without developing a manufacturing base. Where they have done so, it is through either natural resource extraction or the exploitation of specific locational or other advantages. The development benefits associated with manufacturing historically resulted from the absorption of unskilled workers at a productivity premium and the positive spill-over effects of international trade. The manufacturing sector has typically absorbed a substantial part of the economy’s low-skilled labour and placed that labour on a productivity path that rises up to the global frontier. The World Bank Group has released a 255-page report, titled ‘Trouble in the Making? The Future of Manufacturing-Led Development’. The report takes an in-depth look at the impact of advances in technology and changing trade patterns on the manufacturing sector’s ability to create jobs and lift people out of poverty in developing countries. Smart automation, advanced robotics and 3-D printing are new factors influencing which locations are attractive for production. According to the report, the production of advanced manufactured goods (such as wearable tech, autonomous vehicles, biochips and biosensors, and new materials) are most likely to co-locate with R&D facilities in high-income economies as they are being developed. This mirrors the manufacture of certain capital goods and advanced inputs (such as semiconductors, doped wafers for semiconductors, and fiber optic cables), which stayed in high-income economies during Industry 3.0. At the same time, the assembly of high-tech goods such as laptops and mobile phones did move to low- and middle-income economies with Industry 3.0. The authors say that the same is unlikely to happen with the advanced manufacturing product lines associated with Industry 4.0 because of the likely skill and infrastructure requirements throughout the product’s value chain. But the biggest impact on low- and middle-income countries (LMICs) will likely be through new manufacturing process technologies that affect the production of traditional manufactured goods. These new process technologies, by making countries relatively more efficient in producing traditional goods, can have implications for comparative advantage and therefore patterns of globalisation. The greater diffusion of existing ICT technologies can reduce trade and coordination costs and strengthen globally fragmented production. There is evidence that more widespread use of scale-neutral digital technologies, such as ICT, have allowed firms in some low- and middle-income economies to access wider markets through reducing the costs of matching buyers and sellers all over the world. These technologies include smartphones, video and virtual-reality conferencing, and computer translation. Increased automation in high-income countries due to greater robotics use and other Industry 4.0 initiatives like smart factories have already enabled some leading firms, albeit in small measure, to reshore historically labor-intensive manufacturing activities back to high-income economies and closer to the final consumers. However, the report finds that the trend of re-shoring is exaggerated. China is highlighted as a middle-income country that is rapidly automating production through robotisation to address declining wage competitiveness. Recently there have been expectations of an en masse migration of light manufacturing activities from China to poorer economies with lower labor costs, such as those in Sub-Saharan Africa. If China moves into more sophisticated exports while automating and retaining market share of the less sophisticated exports, then this migration might be limited. 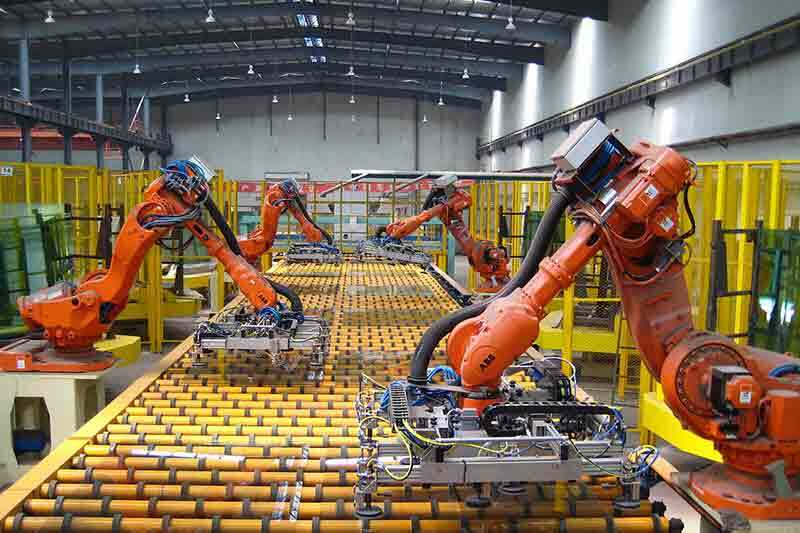 By reducing the relative importance of wage competitiveness, robotics and smart factories can change what it takes for locations to be competitive in the global market for manufactures. Several large emerging markets (including Brazil, India, Indonesia, Malaysia, Mexico, Thailand, and Turkey) also had nontrivial stocks of industrial robots in 2015 and there is evidence of “smart” production processes in these countries—for example, in the 3-D printing of auto parts in India. Many multinational corporations are increasingly locating high-skilled, ICT-heavy, and technical skill-based work in emerging markets, owing to the availability of technical and engineering talent at competitive wages. Outward FDI from emerging markets for the acquisition of technology or other know-how from firms based in Europe and the United States might also accelerate the incorporation of Industry 4.0 technologies. The report notes that 3-D printing, is still too costly to be widely used but it can be either scale-reducing or scale-enhancing, with mixed implications for the geography of global production. Scale is expected to matter less with 3-D printers than with other new manufacturing process technologies, and the demand for customized, quickly delivered goods could lead to geographically dispersed manufacturing activity—that is, a “micromanufacturing” model, whereby even small businesses in a wide range of LMICs can access international designs and print them locally. However, this scenario might be constrained by the scarcity of trained technicians and engineers or by infrastructure issues, such as reliable electricity supply. The weak protection of intellectual property rights could deter firms from sending designs to places where they can easily be printed without limit for customers not paying license fees or royalties. Further, countries that are not open to trade in services risk being left behind because the 3-D printing model effectively substitutes trade in services (through the payment of license fees and royalties for designs) for goods trade. There could therefore be reshoring and concentration of 3-D printing activity, likely close to major markets in Europe, North America, and Asia as well as potentially the largest of the emerging markets. Is manufacturing-led development still viable? The impact of emerging technologies combined with slowdown in trade and global value chains remaining concentrated among a relatively small number of countries, might mean that manufacturing will no longer offer an accessible pathway to growth for LMICs. Some manufacturing industries will remain feasible entry points for less industrialised countries, including some industries that are labor-intensive. For manufacturing sectors that are more automated and where trade is more concentrated, the report notes that although technology may be disruptive, the inability to use it may be even more disruptive. It also finds doomsday scenarios about technological unemployment to be overblown, expecting new technologies to lead to greater job creation, as in the past. But the authors say that though manufacturing will likely continue to deliver on productivity, scale, trade, and innovation, it will not do so with the same number of jobs. The productivity of services, especially those ‘embodied’ in goods, will be increasingly important for the feasibility of manufacturing-led development. Services are embodied in manufacturing production, either as inputs (such as design, marketing, or distribution costs included in the value of a good) or as enablers for trade to take place (such as logistics services or e-commerce platforms). Globally, more than one-third of the value of gross manufactures’ exports come from the value added of embodied services. The servicification of manufacturing is further enabled by using data that will play an increasingly important role in “smart” manufacturing. IoT, where networks, machines, and computers are connected to the Internet, requires the sending and receiving of data across the entire production chain. ICT services—such as custom computer programming services, software publisher services, telecommunications services, Internet publishing, and data processing services such as cloud computing—produce data for technology-intensive smart factories. At the same time, telecommunications, information services, and publishing services are also the most data-intensive sectors in terms of the use of data. Other services that are strong users of data include office support and business services, computer programming services, engineering services, advanced data analytics, advertising and market research, and R&D services. However, the features of manufacturing once thought to be uniquely special for productivity growth are increasingly shared by some service sectors, that are internationally tradable through ICT advances (regulatory barriers continue to inhibit actual trade in these services), yield the benefits of scale, and contribute to technology development. But sufficient human capital development would be required to ensure the absorption of labour in these productivity-enhancing service sectors—finance, information technology, accounting, and legal services—which are also highly skill-intensive. The report seeks to identify policy priorities that can help these economies face the challenges and harness the opportunities they bring. The report offers “3Cs” for countries seeking to bolster their manufacturing sectors: competitiveness, capabilities and connectedness. Ensuring competitiveness will increase the importance of reforms that reduce unit-labor costs. But it will also require each economy to be better able to consider new business models; to seek new contracting relationships that embrace new technologies; and to devise new ways for manufactured goods to also deliver services. Building capabilities will involve giving workers new sets of skills, strengthening firms’ abilities to absorb new technologies, and providing new infrastructure and new rules to support the use of new technologies. Promoting connectedness will continue to emphasise openness to trade in goods, including raw materials and components. But it also increases the importance of grasping the synergies with services that are increasingly embodied and embedded within manufactured goods.